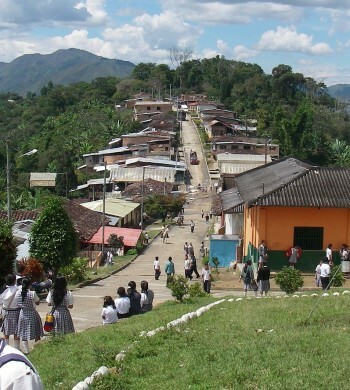 The town of Inzá is located in the department of Cauca, just across the border from its neighboring department of Huila. In fact, a few of the villages or veredas within Inzá are just a stone’s throw from some of the veredas within the Monserrate community. As one might expect, the quality and profiles available from Inzá can be very close matches to some of our favorite Huila coffees. Atlas’ Inzá coffees come from 10 veredas around the town: Guanacas, La Milagrosa, Turmina, Santa Teresa, Pedregal, San Antonio, Yaquiva, San Andres, Segovia and Viboral. Smallholder producers use traditional fermentation to wash their coffee, which is then sun-dried on raised beds on their farms. Average farm size is 1 – 2 hectares, with an average production of 10-20 bags/year total between Cauca’s main and fly crops. While we’ve been purchasing Inzá coffee on a seasonal basis for years, we’re just beginning to explore the potential of this amazing region. As we become more familiar with the various profiles available, keep an eye out for more traceable lots available on our offer list. For now, we hope you enjoy our community lots! Coffee from Inzá is a fantastic compliment to our traceable offerings from Huila and Tolima, adding a unique profile to an already diverse spectrum.